In 1985 two forward-thinking women from Michigan mixed up the First batch of Sojos in their own kitchen. Our First product, Sojos original, was based on the Teachings of Juliette de barnacle levy, considered the grandmother of Herbal medicine. This first-of-its-kind pre-mix was soon followed by tasty gourmet treats. Steve's Real Food DogNog Freeze Dried Goat Milk EnhancementsIngredients: Raw Goat Milk, Whole Egg, Coconut Flour, Cranberry, Turmeric, Yucca, Bromelain.Steve's Real Food DogNog Freeze Dried Goat Milk Enhancements formula was designed to either provide something that a kibble-only diet is lacking, or to help correct something it is causing. 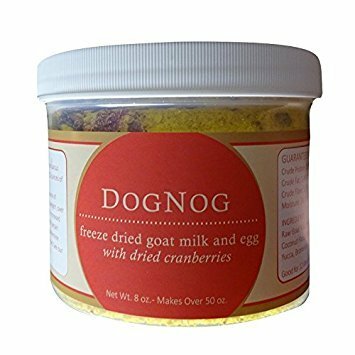 DogNog benefits pets with inflammatory issues, allergies, mobility issues, cognitive and urinary tract issues. 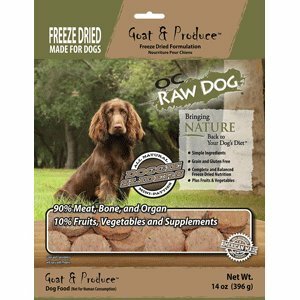 Steve's Real Food DogNog Freeze-Dried Goat Milk and Egg with Dried Cranberries Dog Supplement Steve's Real Food Enchance DogNog is formulated with nutrient packed freeze-dried goat milk, and is then infused with whole eggs, cranberries, tumeric and yucca. Yucca is a natural anti-inflammatory and is great for hip and joint issues, allergies, or pets with inflammatory diseases such as IBD. Cranberries are great for urinary health, are rich in vitamin C, and contain flavonoids comprised of a complex profile of anthocyanins and pronthocyanidins. It is formulated to provide a method of enhancing your dogs diet by adding it to kibble or fed as a snack. It is packaged in a reusable glass milk bottle, so all you need to do is fill it with water, shake, and pour over your pet's food, or give it to them as treat or bedtime snack. Product Benefits: Raw Goat Milk Yogurt Great for Hip & Joint Health Easy to Feed Made from Free-Range, Grass-Fed Goats Hormone & Antibiotic Free Instructions: Simply fill this reusable milk bottle with water to the fill line and shake to rehydrate. Store in the refrigerator and feed daily. For everyday feeding, pour one half ounce of DogNog for every 10 lbs of body weight over your pet's food or in a separate bowl. 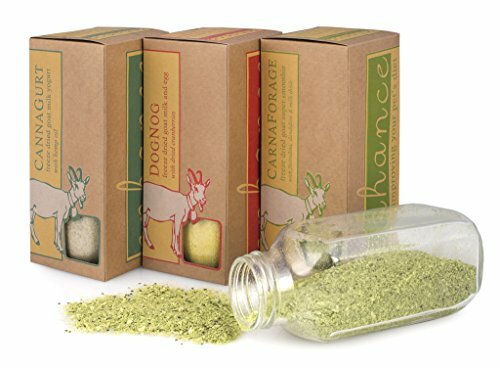 Steve's Real Food Enchance CarnaForage provides dogs with a nutrient rich addition to their daily diet. 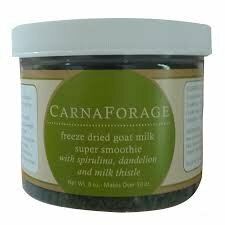 It is made with real Freeze-Dried Goat Milk, which is infused with greens including Spinach, Kale, Spirulina, and Dandelion. This combination milk thistle and dandelion can help protect the liver. The greens in the formula provide high levels of L-glutamine, a conditionally essential amino acid which is needed for good digestive health. 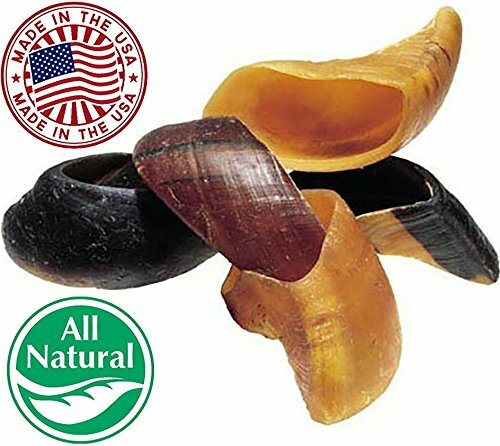 It is formulated to provide a method of enhancing your dogs diet by adding it to kibble or fed as a snack. 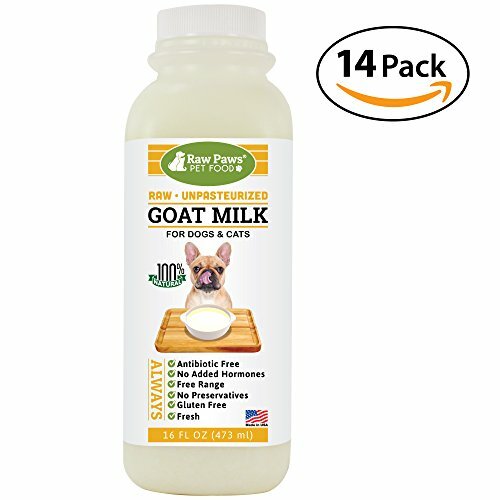 Product Benefits: Raw Goat Milk Yogurt Great for Digestive Health Easy to Feed Made from Free-Range, Grass-Fed Goats Helps Protect the Liver from Toxins Hormone & Antibiotic Free Instructions: For a 12 ounce serving, scoop 1/2 cup of CannaGurt into your reusable milk bottle or any sealable container. Add 10 ounces of water and shake to rehydrate. Shake before each feeding. For everyday feeding, pour one half ounce for every 10 pounds of body weight over your pet's meal or in a separate bowl. Increased feeding may be beneficial for pets with certain health issues. 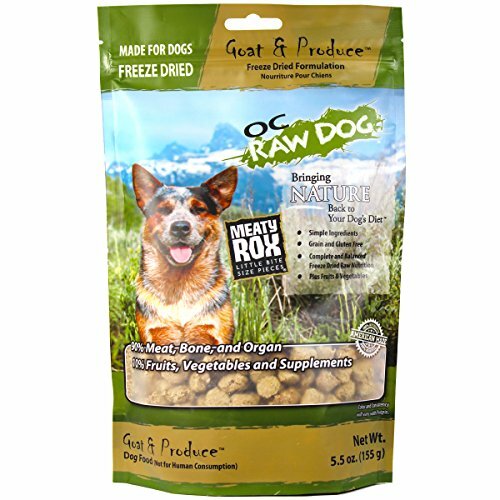 Freeze-dried, raw dog food made of human-grade produce and proteins. Contains limited ingredients; and is free of grains and gluten. Provides an easy way to feed your dog a raw food diet. Feed as a treat, meal topper or hydrate and feed as a complete meal. Species: Dogs Specifications: 90% meats, bones and organs. 10% fruits, vegetables and supplements. If you are feeding as a complete meal without re-hydrating, be sure to have ample water available. All varieties are formulated to meet the nutritional levels established by the AAFCO Dog Food Nutrient Profiles for all life stags. For maximum freshness, store in resealable bag at room temperature, in a cool, dry place. It's recommended to store this food separate from ready-to-use food. If the food is not completely consumed within 2 hours, store in the refrigerator until the next feeding. After 24 hours, discard any leftovers. Always wash your hands, bowls and handling surfaces with hot soapy water after use. All protein formulations are specifically designed for easy rotation and transition from other foods. 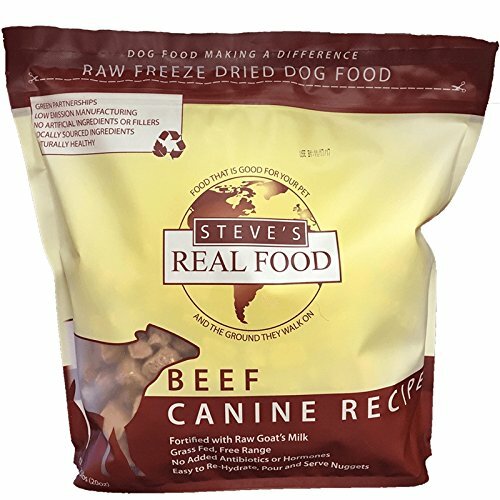 Steve's Real Food Freeze-Dry Products are the latest in our growing line of quality products designed to make your raw-feeding life easy, convenient, and affordable. Freeze-Drying has many advantages: It makes the product shelf stable so you can put it in your pantry or take it on a camping trip It preserves the raw nutrition without taking up space in your freezer It makes a great treat for training Our small nugget size is convenient to feed and faster to produce than other freeze-dry products on the market, making it better quality You can use the to help transition finicky cats - pour it over their dry food or hide it around the house for them to hunt Adds variety and convenience to your pet's diet All our diets come in 1.25-pound bags of nuggets and are complete and balanced for all life stages. In order to provide your pets with a naturally healthy diet, we source clean, whole foods from trusted farms that are committed to the quality of foods they produce. We focus on superfoods such as coconut oil, kelp, and seeds to make each bite rich in micro-nutrients, vitamins, and enzymes. We also follow the biologically appropriate raw food model and use an 80:20 ratio of meat-to-produce to ensure that your pets are getting a nutritionally balanced diet that is easy to digest. Looking for more Raw Goat similar ideas? Try to explore these searches: Clean Front Pencil Skirt, 1980 Hockey Jersey, and High Quality Art Oil Painting. Look at latest related video about Raw Goat. Shopwizion.com is the smartest way for online shopping: compare prices of leading online shops for best deals around the web. 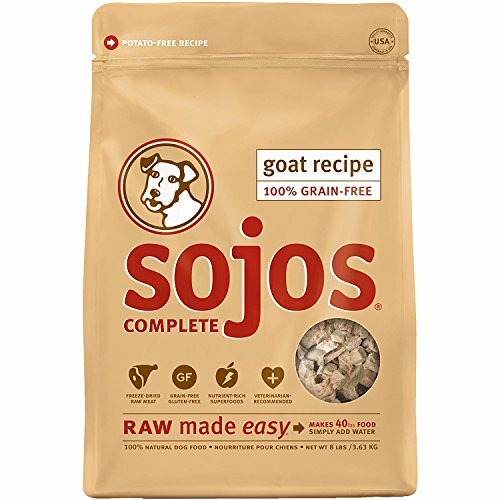 Don't miss TOP Raw Goat deals, updated daily.